White Southerners do not know who they are, because they do not know who they were, because their true history has been systematically suppressed or distorted beyond recognition. So they are no longer a people. And as mere individuals, the traditional Southerners can no longer defend their basic interests in the national arena, or even in their own homeland. Every demagogue or racial hustler who comes along can guilt-trip today's Southerners into doing his bidding by bludgeoning them with the "official" history of the South. That "official" history is actually the propaganda from an unending ideological war which various groups of Northern liberals have been waging against the South ever since the 1830s. After the North won its 1861-65 war against the South, that Northern-liberal propaganda became the "official" American history that is taught universally in the classrooms, in the movies, on TV, and in the books, magazines, and newspapers. It teaches that the war was a civil war; that the South started it; that the North fought it to free the slaves; and other such blatant lies. That omnipresent "official" history also teaches that the North is good and the South is bad; that the liberals are good and the conservatives are bad; that the blacks and the feminist white­ women are good and the white males are bad; and that a totalitarian-socialist government (under some other name, of course) would be good for the U.S., and that limited government in a republic under the U.S. Constitution is very bad. The Southerners have had no defense against the liberals' "official" history, because there have been no books to refute systematically that ocean of "official" lies about the South. This book examines the true relations between the North and the South from 1830 to June 2000. It identifies the real history of each region, and the lies and distortions by which the Northern liberals have created totally-false stereotypes of both the Northern liberal and the traditional white Southerner. It tells what the North has done to the South; and why the North claims to have done it; and why the North really did it; and what the consequences have been. With that history laid out in one volume, the strategy and tactics of the liberals' ideological war against the South then become obvious. The traditional Southerners (and the conservatives of the other regions) can then identify the viciousness and destructiveness of the liberals' war against them. If you are sick of living in a society which believes that life has no meaning or purpose; a society which is being balkanized into hostile tribes of races, ethnic groups, genders, and fanatical single-interest groups that attack one another incessantly; a society which prizes individual selfishness and knee-jerk-reflex consumerism above all else, and is characterized by alienation, road rage, a dog-eat-dog corporate culture, and an all-pervasive emptiness, this book offers a solution. It proposes that the South wage a war of ideas-an ideological revolutionary war-against the North's failed liberalism, so as to restore the traditional society of decency to the South, and bring sweetness and tranquility back into the lives of the Southerners. This book also has a powerful message for conservatives everywhere: it tells how the ideological liberals have sold socialism to the American public step by step since the late 19th century. It tells how the liberals have falsely tied racial discrimination so tightly to Southern states' rights in the public mind as to make states' rights anywhere (thus, constitutional government) unacceptable to the American public. The liberals' goal is totalitarian socialism; and the only way to head them off is by dismantling their Southern- racial- discrimination propaganda trap which demolishes all states' rights. The South has always been the liberals' battlefield; and the Northern conservatives who refuse to join the Southern conservatives in the fight there will soon find themselves helpless cogs in the ideological liberals' U.S. workers' paradise. This book is that rarity of rarities, a history of the South covering the turbulent 19th and 20th centuries, written from the Southern- conservative viewpoint. Its central theme is the devastating culture-war which various groups of Northern liberals have been waging against the conservative South since the 1830s, using the South as their battleground to defeat limited republican government under the tenets of Christianity in the U.S. as prescribed by the Constitution, and replace that with a socialist nation-state run under the religion of secular humanism. This book identifies key events in American history which, although indisputable, are nevertheless ignored or distorted by the mainstream liberal historians; and it puts those events in proper perspective. The result is a book which reads like the history of an entirely different country than the one we are accustomed to reading about in most American-history texts. 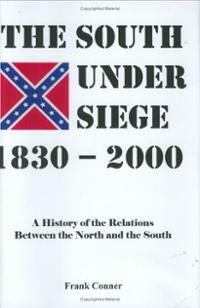 This book tells how Northern capitalists and their politicians used the culture war to support an economic war of their own against the South, which led directly to the 1861 - 1865 War of Northern Aggression, following which the federal government converted the South into the agricultural colonies of the Northern capitalists, governed under bayonet rule, and deliberately held in grinding poverty until WWII. And now the liberal dominated institutions of the U.S. are systematically discrediting and suppressing the beliefs, values, culture, and true history of the traditional South, in order to destroy the conservative Southerners as a people, and remove the last big roadblock hindering their transformation of the U.S. into a socialist nation-state. The South Under Siege 1830 - 2000 will be of no interest to ideological liberals; but if you want to know why the U.S. is now divided into red states and blue states; and what is happening to the South right now--and will happen to the rest of the U.S. in the very near future, this is one of the few books that will provide real answers.